It took me a long, long time to warm up to the idea of having salad as a meal. It always seemed like an unexciting side dish or, more often, something that could be skipped altogether. Greens, in general, failed to entice me through pretty much all of my childhood, adolescence and most of my adult years. It's only a very recent development that my eyes and taste buds have opened to all the glorious possibilities that vegetables offer. But now that I know better, I can't stop eating salad and other market veggies. I find myself stopping at the various vegetable stands at the Union Square farmers' market and buying four different kinds of lettuce just because they look so fresh and rich and pretty. I'll come home and while away an afternoon separating the leaves, dropping them into water and swishing them around the big bowl watching all the dirt and sand drift slowly to the bottom. I'll do this until my lettuce is sparking clean, grit-free. I recently invested in a much-needed salad spinner, which makes all the difference when making a salad (the leaves need to be thoroughly dried, otherwise the dressing will become diluted and won't stick). I'll watch the fresh bright greens take their turns around the spinner and then lay them out on clean dish towels to rest while I start on the vinaigrette. It's all very therapeutic, this washing lettuce business. And then the vinaigrette! I make a delicious garlic vinaigrette recipe that Alice Waters uses most often when making her own salads (what's good enough for Alice....). It's super easy and quick and worlds apart from any bottled dressing you can buy in a store (yes, even the fancy kind). When I pour this finished vinaigrette over my fresh-as-can-be lettuce and take the first bite, I wonder how on earth I could possibly have thought of salad as "boring." I do this every single time. This salad dressing is a perfect Milk & Mode food. It's simple. It's fool-proof. It's fast. It's healthy. You can make it in ANY kitchen, no matter how big or small. And you can whip it up with almost no effort even after a long day of work. And the best part? You'll have extra servings that you can put into a glass jar and use for tomorrow's lunch or dinner also. And you just can't argue with that. Put a peeled garlic clove and 2 big pinches of salt in a mortar and pound into a puree, with no chunks remaining. Add the wine vinegar, grind in some black pepper, and taste for the balance of salt and vinegar. Allow to macerate for a few minutes and whisk in olive oil. Taste the dressing with a leaf of lettuce. It should taste bright and lively without being too acidic or too oily; adjust the salt, vinegar, or oil as needed. 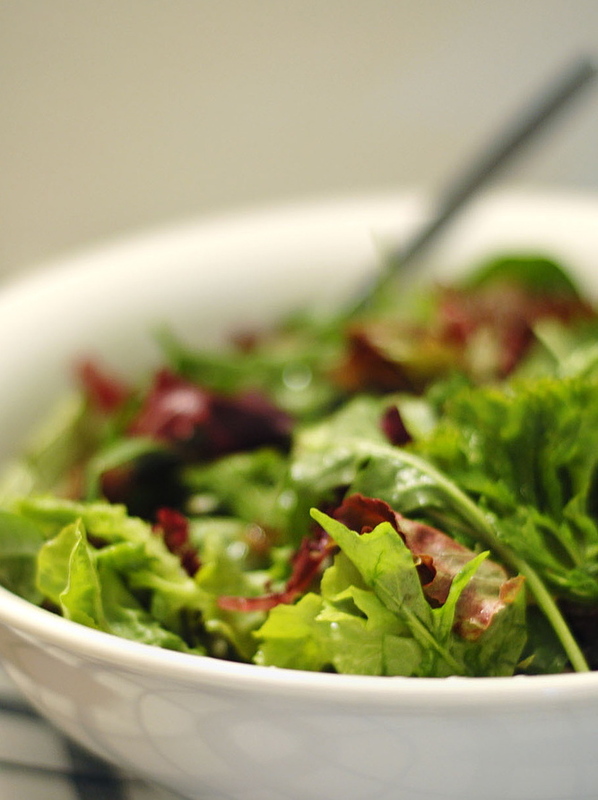 To dress a salad, put several generous handfuls of washed and dried lettuce into a large bowl. Toss with about three quarters of the vinaigrette, and taste. The lettuce should be lightly coated but not overdressed; add more dressing as needed. *A squeeze of lemon juice added to the dressed salad at the last moment can add a brightness that brings up all the flavors. mm mm mmmm that vinaigrette sounds delicious! Thank you! i love my veges!! that salad looks yum!!! yum the garlic vinaigrette sounds good and I love arugula. will def have to try making this one day!